The Congressional Budget Office (CBO) and the staff of the Joint Committee on Taxation (JCT) have completed a preliminary analysis of the major provisions related to health insurance coverage that are contained in title I of draft legislation called the Affordable Health Choices Act, which was released by the Senate Committee on Health, Education, Labor, and Pensions (HELP) on June 9, 2009. Among other things, that draft legislation would establish insurance exchanges (called “gateways”) through which individuals and families could purchase coverage and would provide federal subsidies to substantially reduce the cost of that coverage for some enrollees. decrease in the number of people uninsured would be about 16 million. It is important to note, however, that those figures do not represent a formal or complete cost estimate for the draft legislation, for reasons outlined below. Moreover, because expanded eligibility for the Medicaid program may be added at a later date, those figures are not likely to represent the impact that more comprehensive proposals—which might include a significant expansion of Medicaid or other options for subsidizing coverage for those with income below 150 percent of the federal poverty level— would have both on the federal budget and on the extent of insurance coverage. • First, this analysis focuses exclusively on the major provisions on health insurance coverage contained in certain subtitles of title I of the draft legislation. 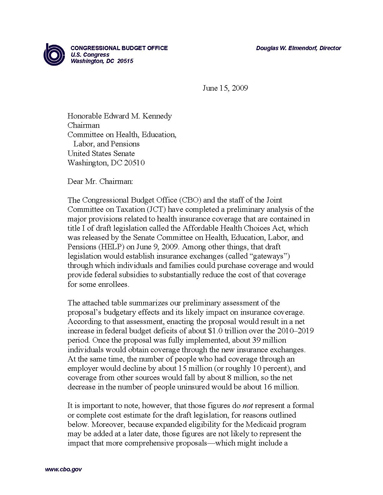 Although other provisions in title I, along with provisions in the other five titles of the legislation, would have significant budgetary effects, the analysis contained in this letter and its attachment is limited to the provisions in subtitles A through D regarding health insurance coverage. • Second, CBO and the JCT staff have not yet completed modeling all of the proposed changes related to insurance coverage. For example, the proposal would allow parents to cover children as dependents until they are 27 years old, and our analysis has not yet taken that provision into account. (Other instances are listed in the attachment.) Although this analysis reflects the proposal’s major provisions, taking all of its provisions into account could change our assessment of the proposal’s effects on the budget and insurance coverage rates—though probably not by substantial amounts relative to the net costs already identified. As our understanding of the provisions we have analyzed improves, that could also affect our future estimates. impose a clear requirement for individuals to have health insurance, and this analysis reflects that intent. However, the current draft is not clear on this point, and if the language remains ambiguous, that would affect our estimate of its impact on federal costs and insurance coverage. • Fourth, some effects of the insurance proposals that we have modeled have not yet been fully captured. For example, we have not yet estimated the administrative costs to the federal government of implementing the proposal or the costs of establishing and operating the insurance exchanges, nor have we taken into account the proposal’s effects on spending for other federal programs. Those effects could be noticeable but would not affect the main conclusions of this analysis. • Fifth, the budgetary information shown in the attached table reflects many of the major cash flows that would affect the federal budget as a result of the proposal and provides our preliminary assessment of its net effects on the federal budget deficit. Some cash flows would appear in the budget but would net to zero and not the affect the deficit; CBO has not yet estimated all of those cash flows. The proposal would have significant effects on the number of people who are enrolled in health insurance plans, the sources of that coverage, and the federal budget. Effects on Insurance Coverage. Under current law, the number of nonelderly residents (those under age 65) with health insurance coverage will grow from about 217 million in 2010 to about 228 million in 2019, according to CBO’s estimates. Over that same period, the number of nonelderly residents without health insurance at any given point in time will grow from approximately 50 million people to about 54 million people—constituting about 19 percent of the nonelderly population. Because the Medicare program covers nearly all legal residents over the age of 65, our analysis has focused on the effects of proposals on the nonelderly population implemented, the number of people who are uninsured would decline to about 36 million or 37 million, representing about 13 percent of the nonelderly population. (Roughly a third of those would be unauthorized immigrants or individuals who are eligible for Medicaid but not enrolled in that program.) That decline would be the net effect of several broad changes, which can be illustrated by examining the effects in a specific year. In 2017, for example, the number of uninsured would fall by about 16 million, relative to current-law projections. In that year, about 39 million people would be covered by policies purchased through the new insurance exchange. At the same time, about 147 million people would be covered by an employment-based health plan, 15 million fewer than under current law. Smaller net declines (totaling about 8 million) would occur in coverage under Medicaid and CHIP and in nongroup coverage because of the subsidies offered in the exchanges. Budgetary Impact of Insurance Coverage Provisions. On a preliminary basis, CBO and the JCT staff estimate that the major provisions in title I of the Affordable Health Choices Act affecting health insurance coverage would result in a net increase in federal deficits of about $1.0 trillion for fiscal years 2010 through 2019. That estimate primarily reflects the subsidies that would be provided to purchase coverage through the new insurance exchanges, which would amount to nearly $1.3 trillion in that period. The average subsidy per exchange enrollee (including those who would receive no subsidy) would rise from roughly $5,000 in 2015 to roughly $6,000 in 2019. The other element of the proposal that would increase the federal deficit is a credit for small employers who offer health insurance, which is estimated to cost $60 billion over 10 years. Because a given firm would be allowed take the credit for only three consecutive years, the pattern of outlays would vary from year to year. Those costs would be partly offset by receipts or savings from three sources: increases in tax revenues stemming from the decline in employment-based coverage; payments of penalties by uninsured individuals; and reductions in outlays for Medicaid and CHIP (relative to current-law projections). The proposal would not change the tax treatment of health insurance premiums. Nevertheless, the reduction in the number of people receiving employment-based health insurance coverage, relative to current-law projections, would affect the government’s tax revenues. Because total compensation costs are determined by market forces, CBO and the JCT staff estimate that wages and other forms of compensation would rise by roughly the amounts of any reductions in employers’ health insurance costs. Employers’ payments for health insurance are tax-preferred, but most of those offsetting changes in compensation would come in the form of taxable wages and salaries. As a result, the shift in compensation brought about by the proposal would cause tax revenues to rise by $257 billion over 10 years. (Those figures are generally shown as negative numbers in the attached table because increases in revenues reduce the federal budgetPeople obtain insurance coverage from a variety of sources. Under current law, about 150 million nonelderly people will get their coverage through an employer in 2010, CBO estimates. Similarly, another 40 million people will be covered through the federal/state Medicaid program or the Children’s Health Insurance Program (CHIP). Other nonelderly people are covered by policies purchased individually in the “nongroup” market, or they obtain coverage from various other sources (including Medicare and the health benefit programs of the Department of Defense). According to the preliminary analysis, once the proposal was fully deficit.) The government would also collect the payments that uninsured individuals would have to make. CBO and the JCT staff assume that the annual amount, which would be set by the Treasury Secretary, would be relatively small (about $100 per person). Moreover, individuals with income below 150 percent of the federal poverty level would not have to pay that amount. As a result, collections of those payments would total $2 billion over 10 years. Finally, although the proposal would not change federal laws regarding Medicaid and CHIP, it would affect outlays for those programs. CBO assumes that states that had expanded eligibility for Medicaid and CHIP to people with income above 150 percent of the federal poverty level would be inclined to reverse those policies, because those individuals could instead obtain subsidies through the insurance exchanges that would be financed entirely by the federal government. Reflecting those reductions in enrollment, federal outlays for Medicaid and CHIP would decline by $38 billion over 10 years. I hope this preliminary analysis is helpful for the committee’s consideration of the Affordable Health Choices Act. If you have any questions, please contact me or CBO staff. The primary staff contacts for this analysis are Philip Ellis and Holly Harvey.